After the Tikuna the Navy initially planned to construct one or two SMB-10, a conventional submarine projected to have a loaded displacement of 2,500 tons, with double pressure hull with 8 meters diameter and 67 meters long. It will be a group of test benches for the Nuclear SNA (Submarino of Attack). Already of entirely national project, a version of the Siconta expects that the sensors and the CIC/COC(centro of operations of combat) are also national, probably installed in the Niteróis Frigates and the Barroso Corvette. For the next Brazilian attack submarine, the class SMB-10, Brazil had to choose a foreign partner to assist in the project of this ship. 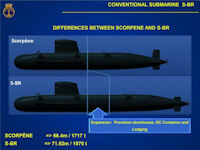 Some politicians would focus on the common areas between this project and the nuclear submarine future of attack. The choice fell again between Germany, France, Russia and Sweden. The chosen country will have an enormous advantage on the specification of the embarked systems, and moreover it will have forged a lasting partnership with Brazil, that will be able to relieve good fruits in other programs. For the Brazilian program, Russia offered the technology of the class "Amur 1650", submarine developed for the Bureau of Rubin Projects, S. Petersburgo. Dislocating 1.765t in the submerged surface and 2.650t, this submarine has 66,8m of length and resistant hoof with diameter of 7,1m - almost a meter more than the class Tupi. The first unit of the Russian variant of Amur 1650 -- known as class Lada (Project 677), was constructed for the Russian navy the Sankt Petersburg, was launched in 2000. It will have to initiate the tests of sea in briefing, with incorporation foreseen for the next year. Brazil and France signed a $4.25-billion contract on the construction of the four enlarged S-BR diesel-electric submarines, jointly designed by France and Spain, in 2008. The first submarine in the series was to enter active service in 2015. On 23 December 2008 DCNS was awarded a major contract by the Brazilian Navy. The customer entrusted DCNS with the design and construction of four conventional-propulsion submarines based on the Scorpene type. Under a technology transfer agreement, the technical assistance will include the design and construction of the non-nuclear part of the first Brazilian nuclear-powered submarine, and the support services for the construction of a naval base and a shipyard in Brazil. The contract is part of a vast plan to renew and modernise the Brazilian Navy's submarine fleet. It is also in line with the strategic cooperation agreement in defence signed in Rio de Janeiro by Brazilian President Luiz Inácio Lula da Silva and French President Nicolas Sarkozy. The contract will come into force following a comprehensive approval process in Brazil. DCNS Chairman & CEO Jean-Marie Poimbouf commented: "We welcome the decision by Brazil's highest authorities in favour of DCNS and our Brazilian partner, the Odebrecht Group. This success confirms our capabilities as an overall prime contractor, as well as our technological and competitive standing on the international market. It also confirms our ability to establish partnerships to handle in-country project work, just as we have done in other countries around the world." DCNS will act as prime contractor for four conventional-propulsion submarines to be built by the Joint Venture that will be set up by DCNS and Brazilian partner Odebrecht. The submarines will be designed in cooperation with Brazilian teams under DCNS design authority to meet the Brazilian Navy's specific needs: They will be ideally suited to the protection and defence of the country's 8,500-kilometre coast. The first submarine is scheduled to enter active service in 2015. DCNS will produce key advanced-technology equipment in its own plants. DCNS will provide design assistance - under the Brazilian Navy's design authority - for the non-nuclear part of the Navy's first nuclear submarine, which will be built by the Joint Venture to be set up by DCNS and Odebrecht. DCNS will provide prime contractor assistance to Odebrecht for the construction of the naval shipyard that will build the five submarines covered by today's contract, as well as a naval base for the Brazilian Navy. The submarines proposed by DCNS combine advanced technologies, competitive pricing and optimal cost of ownership, and can be tailored to meet a full spectrum of operational naval needs. The designs for the Brazilian Navy will combine advanced technologies with innovations developed for other programs, particularly with regard to hydrodynamics, acoustic discretion, automation and combat systems. These submarines can be tailored to undertake all types of anti-surface and anti-submarine warfare missions, as well as special operations and intelligence gathering. The construction of four Scorpene-class attack submarines for the Brazilian Navy was launched in July 2011 at a plant near Rio de Janeiro. Brazilian President Dilma Rousseff, who was present at the ceremony, said the construction of the submarines was an important step that would help the Brazilian Navy reach a new level of technological development. The first submarine is expected to enter service in 2017. Scorpene-class submarines are equipped with six 533-mm torpedo tubes for 18 torpedoes or SM.39 Exocet anti-ship missiles, or 30 mines in place of torpedoes. 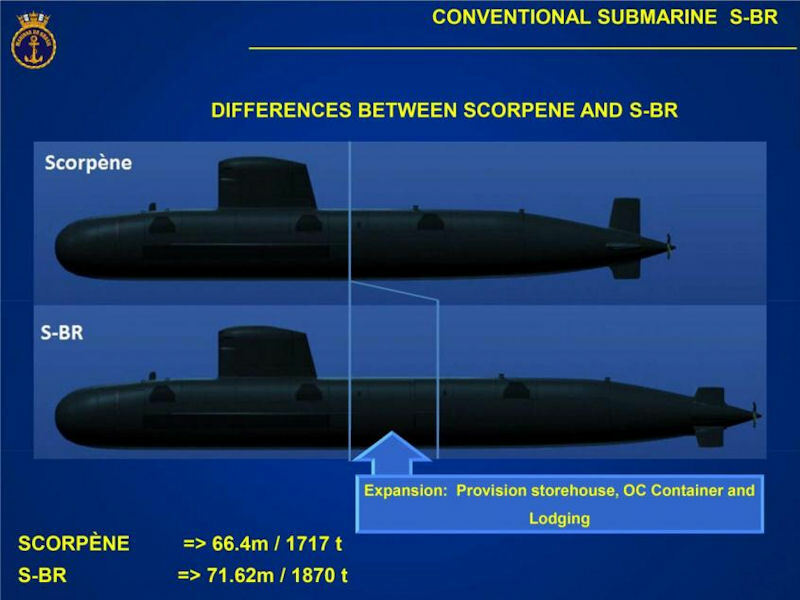 Unlike other modifications of the Scorpene-class submarine, the S-BR submarine is not equipped with an air-independent propulsion (AIP) system which allows a submarine to operate without the need to surface or use a snorkel to access atmospheric oxygen. Compared to the original timetable, by 2017 the program was two years’ behind schedule. According to naval personnel and contractor executives, the main reason is budgetary restrictions. Following the steep decline in the price of oil, one of the country’s main resources, Brazil was forced to cut back on government spending, military programmes being among the most affected. Brazil and France have also signed an agreement to develop a French/Brazilian nuclear powered submarine. In line with the deal, as of 2011 Brazil's first nuclear submarine was scheduled to enter service in 2023.